“User intent”. These are two words I’ve written and said a lot in the past 1,5 years. It’s the ultimate goal of the search engines: finding out your user intent and delivering you with results based on that intent. But “user intent” is really hard to grab. The search engines try to grab it as much as they can by making the results as personal as possible. In the US Google has made the next step in trying to find the intent by making search news even more personal. 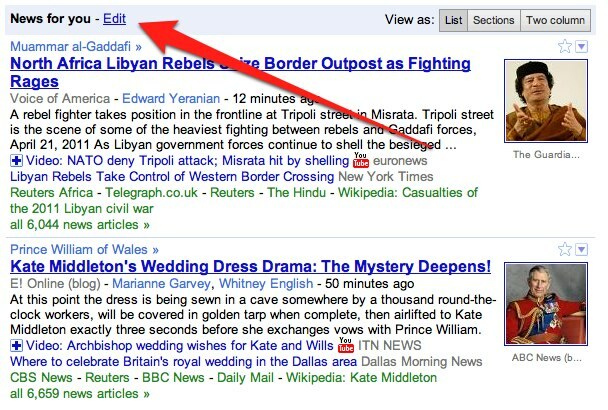 From now on Google News will show you stories based on articles you’ve clicked on before. You need to be signed in to Google for this. Then Google will look at your news-related web history (note WEB history, not SEARCH history) to see what kind of articles you clicked on most and will then return news items based on that. Next to that they are giving you “Recommended Sections” in the side column. These are suggested topics based on the same history as mentioned above. Google News also still has the personalization features which you can manage yourself, like the “news for you section” in which you can tell Google how often you would like to read about specific news topics.